I don’t know exactly how this idea got into my head, but at some point we had a brainstorm about how we could make our big day as sustainable as possible and suddenly I heard myself say: “what if we could make our wedding rings out of scrap phones?” By ‘we’ I mean my fiancé Mélisande and myself, Niels. I’m the communications guy at Closing the Loop. This idea at first seemed quite far-fetched, but when I started calculating and found that we would need at least 400 phones to have enough gold for 2 wedding rings it gave us an exciting feeling. On a normal day, thinking about sustainability and how that what we purchase has an impact on the world is very important to us. On our wedding day this is even more important. As our wedding is a celebration of love, we want that our wedding rings (and all other things for that matter) are also made with love. Collecting 400 scrap phones still sounded like a lot of effort though. However, we both liked the idea and just wanted to see if it would work. Time was not so much of an issue as we planned the wedding in 2018. 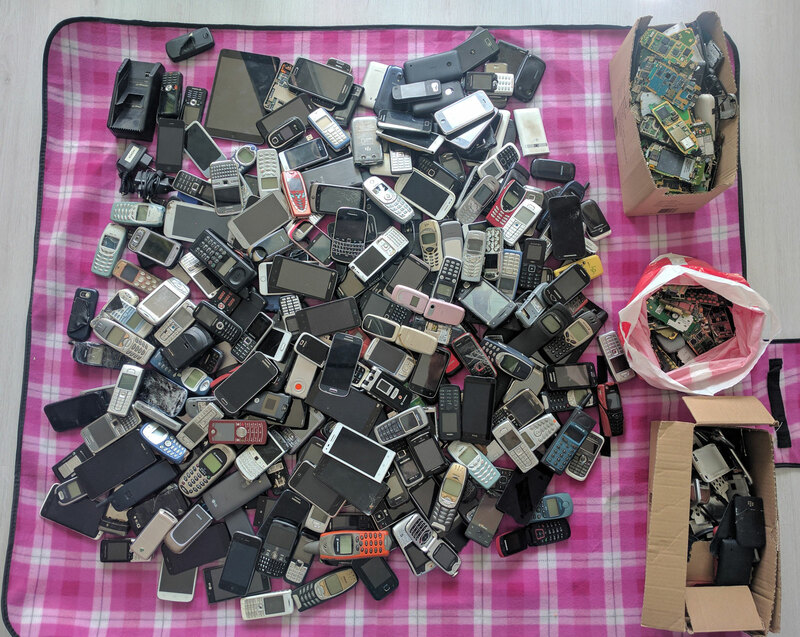 Not knowing if people would like to hand in their old phone (people in the Netherlands can be quite nostalgic about their old Nokia’s) we started by asking family, friends and colleagues in January. Everybody was so enthusiastic that it made us confident enough to think that more people would be interested to hand in their phone. We posted our story on the Closing the Loop website, made our own simple website and organisations like Fairphone shared our request on their social media channels. By the beginning of February we already collected 100 phones! The ball started to roll (as we say in Dutch) and we got nice media attention in local newspapers and had a national radio broadcast. Together with the help from all our family, friends and colleagues we managed to collect the 400 phones within 5 months (and even more are coming in every day!). We never dreamed that it would go so fast and we want to thank everyone who supported us and handed in their phone! Niels has never had this many phones on his living room floor! Earlier I wrote that, for us, making rings from mobile phones is about love. We have received just that. Not only did people give us their old phone, they also wrote small letters congratulating us, wishing us much love and luck and saying how much they liked the idea. We even received a message from someone from Belgium who got inspired and is going to do the same! People close to us and even complete strangers sending us their phone AND their love. That is why we did it. The scrap phones will go to the recycler in the near future. In the meantime our goldsmith is working on some sketches for our wedding rings. We’ll keep you posted!